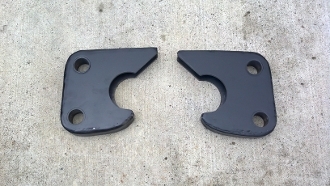 Pair of brackets (one driver, one passenger) that go between our radius arms and axles not equipped with C bushings. These brackets completely eliminate the C bushings all together making for a simple and easy way to adapt all kinds of axles such as the populer Dana 60 high pinion axle. Also works on 3/4 ton Dana 44 axles. Can be used on a rear axle with our radius arms as well. Extremelly durable having been in use on vehicles ranging from the fairly normaly Dana 60 SAS Bronco all the way to 66" tired Mud trucks and rockwell axles. Welding required. These are a build to order item. Please allow 204 weeks for us to build and ship them.